I’ve been invited to a number of cool events that all step off next week. I don’t know if I can get to them (because the economy is recovering), but maybe you can. The events support important causes and you can see some cool people performing. Pardon me for practicing press release journalism, but I think it’s better to get the word out quickly than to try to completely rewrite the info. Wednesday, November 19: Standing in Solidarity with Ferguson, with special guest star Joan Baez. The Stop Shopping Choir, Middle Church Jerriese Johnson Gospel Choir, and The Lower Eastside Girls Club Choir will perform a concert to raise funds for activists in Ferguson, MO. 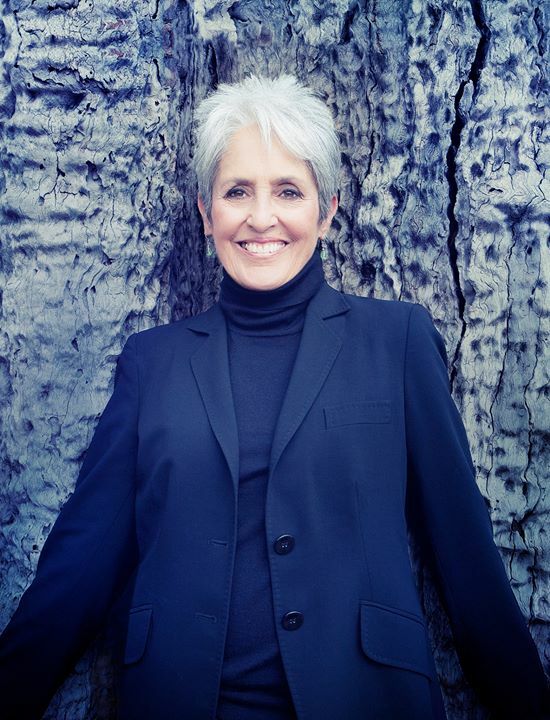 Joan Baez will make a special appearance. She accompanied Dr. King in Selma and Birmingham and sang at the 1963 March on Washington. Baez arrives in New York after seven sold-out shows in Paris. The evening is hosted by The Rev. Dr. Jacqui Lewis, Rev. Billy Talen and the Church of Stop Shopping, and the Lower Eastside Girls Club in the historic sanctuary of Middle Collegiate Church. Bernardo Polombo of El Taller Latino Americano will also sing and additional performers will be announced. The money raised will support This is the Movement, community organizers standing for justice each day in Ferguson. Reverend Billy and the Stop Shopping Choir will present a check to the activists in Ferguson on Black Friday. Tickets are $25, $50, or $125. Thursday, November 20 at 7 PM at the Hillwood Recital Hall At Tilles Center on campus at LIU Post, 720 Northern Blvd, Brookville, NY 11548. Come and enjoy the greatest folk concert Long Island has seen in decades. 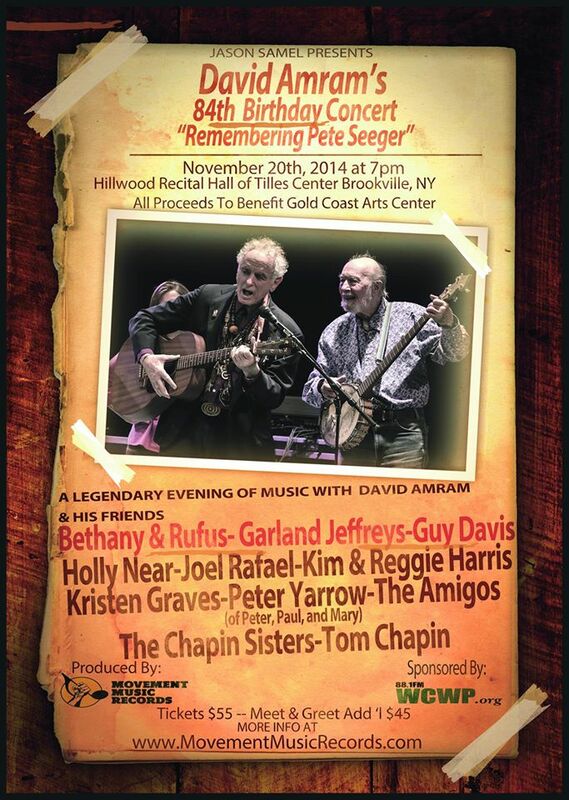 The evening’s performers will include David Amram and his quintet (David Amram, Kevin Twigg, Rene Hart, Robbie Winterhawk and Adam Amram) as well as friends he shared with the late Pete Seeger including Peter Yarrow (of Peter, Paul, and Mary), Tom Chapin, Holly Near, Guy Davis, Garland Jeffreys, Kim & Reggie Harris, Joel Rafael, The Amigos, The Chapin Sisters, Bethany & Rufus and the Connecticut State Troubadour Kristen Graves. Net proceeds will benefit the 501 (c)(3) not for profit Gold Coast Arts Center, a not for profit organization dedicated to supporting and promoting the arts through education, exhibition, performance and outreach. David Amram is an American composer, conductor, multi-instrumentalist, and author. As a classical composer and performer, his integration of jazz (including being one of the first to improvise jazz on the French horn), folkloric and world music has led him to work with the likes of Dizzy Gillespie, Lionel Hampton, Willie Nelson, Langston Hughes, Charles Mingus, Pepper Adams, Leonard Bernstein, Sir James Galway, Tito Puente, Mary Lou Williams, Joseph Papp, Arthur Miller, Arturo Sandoval, Stan Getz, Pete Seeger, Elia Kazan, Christopher Plummer, Ingrid Bergman, Odetta, Lord Buckley, Dustin Hoffman, Steve Allen, Machito, Earl “Fatha” Hines, Allen Ginsberg, Nina Simone, Gregory Corso, Bob Dylan, Steve Goodman, Gerry Mulligan, Sonny Rollins, T.S. Monk, Hunter S. Thompson, Johnny Depp, Levon Helm, Betty Carter and Jack Kerouac. In the early 1950s, he was encouraged to pursue his unique path by mentors such as Charlie Parker, Thelonious Monk, the New York Philharmonic’s conductor Dimitri Mitropoulos, Miles Davis, Aaron Copland, Gunther Schuller, and visual artists Jackson Pollock, Joan Mitchell, Willem de Kooning and Franz Kline.